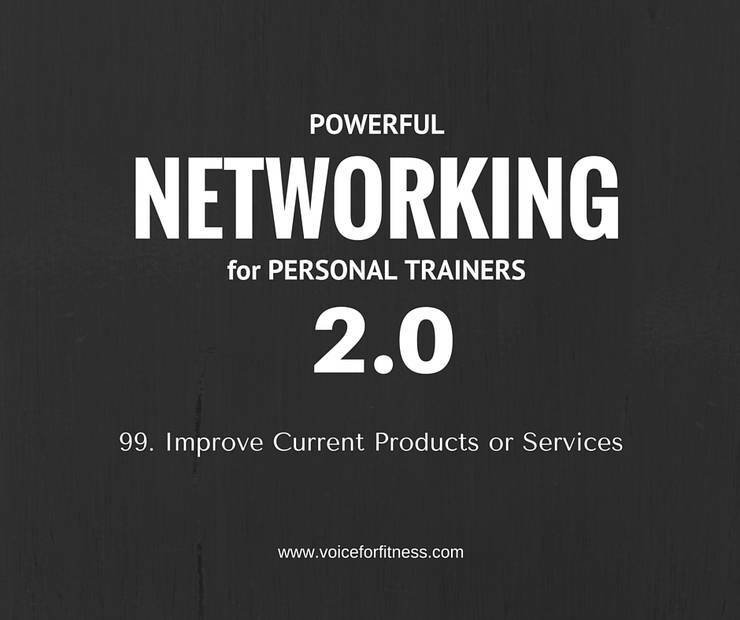 In this post, I begin a series of networking tips evolved from coaching clients, and working directly in facilities – both retirement communities, fitness centers, and university settings – they’re the secrets to successfully leveraging your skills, talents, and connections with others to help them. In turn, your business grows. Often trainers spend time talking about how this is what they do… in the time that other trainers are doing it. The difference between successful networking and promoting yourself as a networker is … one is about you and one is about THEM. When you’re sincerely giving with the goal of developing others, supporting others, with nothing expected in return, you’re on your way. The way of the future successful personal fitness trainer is in the relationships he or she cultivates. They don’t come to us for exercise. They come to us for transformation. Exercise is the beginning of the conversation. Rather than talk about new programs and continue to try to reinvent the wheel, look at your old programs. Bend them, change them, deliver them in a different way. Offer your most successful programs from three or five years ago… with new, fresh, content. If you’ve seen a wildly popular program’s popularity dwindle, couldn’t it be that it got boring, stagnant and predictable? I’ve watched loyal customers re-enroll in programs over and over again all year. They get there early and set up for the trainer! They know how they’re going to start. They know already how to modify the exercises. I’ve seen this, perhaps you have too. That is a cause for a smile for a short time, right? It should also be a red flag. The group together could obviously do the session without the trainer, too. It may have been a program with “endless variety” and “accountability” but after a point the variety is the same variety put together in different order all year. The accountability of a group waiting for you at 5:30am is just as strong as accountability of a payment and a trainer. That program still has potential. Did you look at what worked? Did you look at how you were different? If you come up short on that answer… it’s OK. Be honest. Is that session so like the one happening around the corner or within 10 miles that convenience, a friend doing another program, or an itch to change…was too tempting? How can you improve a current (or an old) program? If you’re not constantly, frequently, reviewing what’s working and what’s going to be new and fresh tomorrow or next week or month, you’re going to have the same scenario happen again and again in your career. If you’re selling last year’s program this year you are falling behind even if you don’t feel it yet. If you’re selling a program from three years ago, you will have a challenging time catching up. It’s not impossible but as you begin to fall behind and failed to notice, you made the road for new programs much easier. Now you have to compete. Your current clients will evolve. A beginner doesn’t stay a beginner. Yet your programs need to always have a beginner option. They are our largest target market. So one improvement for a program might be to offer a same-time program (when you know your group likes it and can attend) that is more advanced. Are you doing intervals for example? A beginner needs more rest. Work intervals are shorter than recovery. There are fewer sets repeated in a group. From one day to the next day there might be two days instead of one. It serves slow recoverers best. Older adults fall into this category, beginners fall into this category. People are overwhelmed with life. How can you make it possible to have a physical touch fewer times a week and provide them with at-home sequences they can do between? This is where your creative juices are best squeezed. Have you written handouts you use? An ebook? Have you done videos you have for resources? Think of those as Version 1. They weren’t perfect then but done is better than perfect. This is the time for Version 2. Take my own example, for instance. I’ve been coaching fitness professionals on marketing, business, and how to develop programming since the mid 90’s. My first “versions” were based on 10+ years of experience from behind the desk (program director), across the desk (personal trainer), and in front of the chalkboard (University Lecturer). But it was still Version 1. I offered value. Had I continued to offer the same kind of programs and coaching though I’d soon have my clients outgrow me or be obsolete. Why would I ever tell you how to run programming in 2015 the same way it would have been done in 1995? Or even 2005, for that matter. You have developed new programs. But you can also find some gold in those current and tired programs. The way of starting a program because a trainer, perhaps you, wants to do a program or use a prop, or took a session and wants to deliver it, is a road to failure. The only successful route to long-term business success is thinking about the customer now. Deliver programs and services that solve their problems. Then think about what that customer will need next. Build it before they ask and before they leave and find it somewhere else.